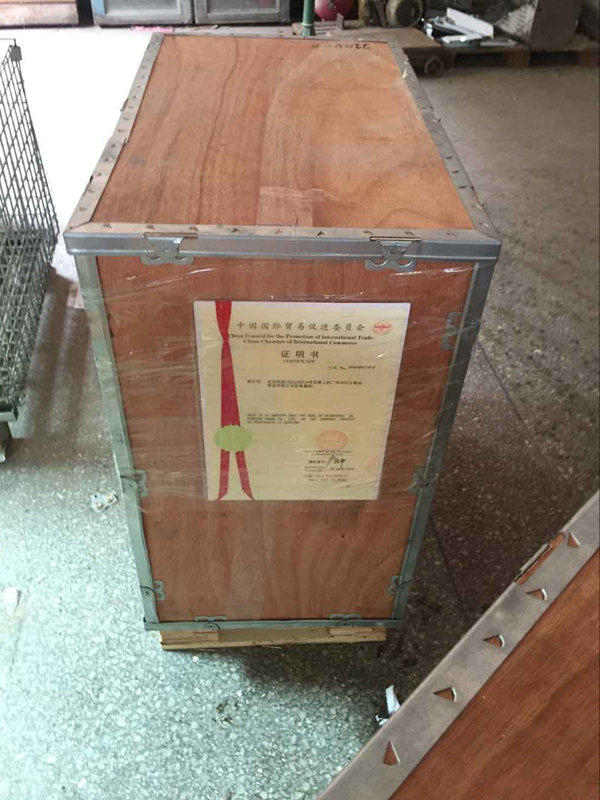 Our customers from Yemen and Syria ordered one(1*) pc of model YX-1.5 tablet making machine recently; They came to our factory for a thorogh check before shipping. After reviewing every details of our machine our customers got satisfied at our machine. 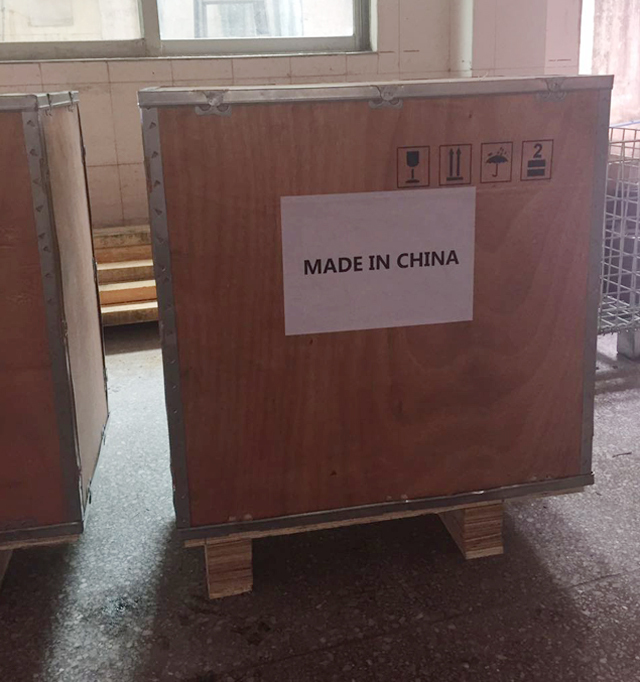 In order to save shipping cost the mid-east customers let us disassemble the machine piece by piece then they can ship it in a most economic way. This is the first time when we counter the case the customer even wants to take and get the machine in pieces instead of one in a whole set. Without any hesitation our engineers two together de-installated the tablet making equipment. 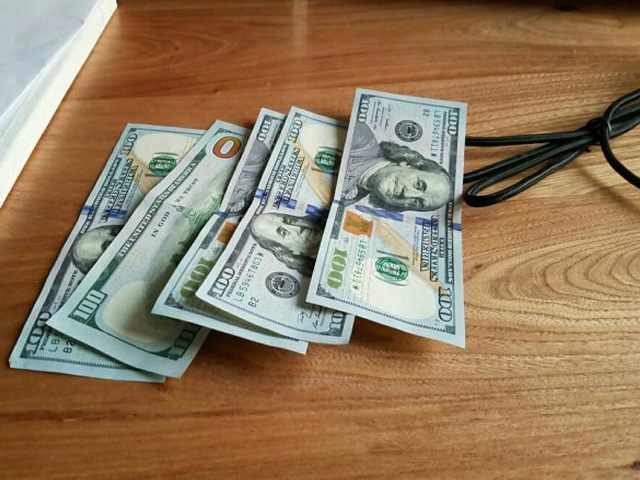 Finally our customers paid the balance by cash in our factory. 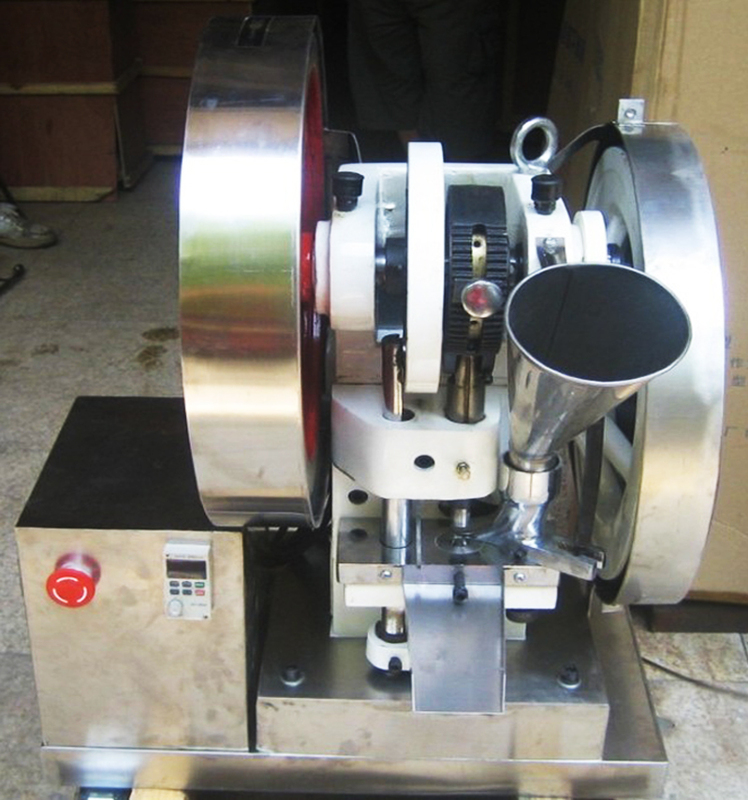 We specially make the demo lest our customer forget how to assemble the single punch machine in the future. 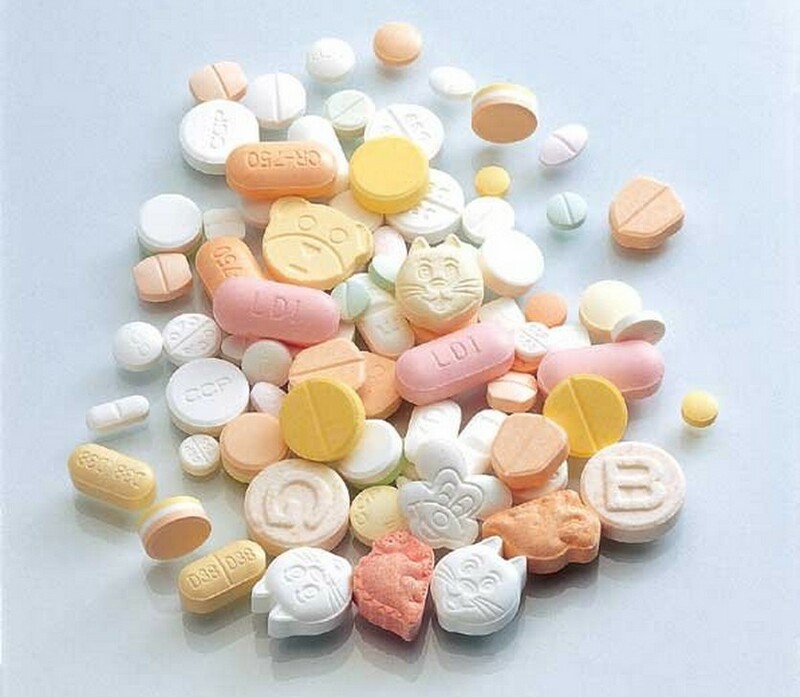 A lot of the branded vitamin tablets on the high street have unnecessary additives and supplements that you just don’t need. This press allows you to mix the vitamins and supplements that you require for your exact diet and convert them into convenient pills.Maybe you are considering setting up a small business selling vitamin, weight loss or herbal tablets. 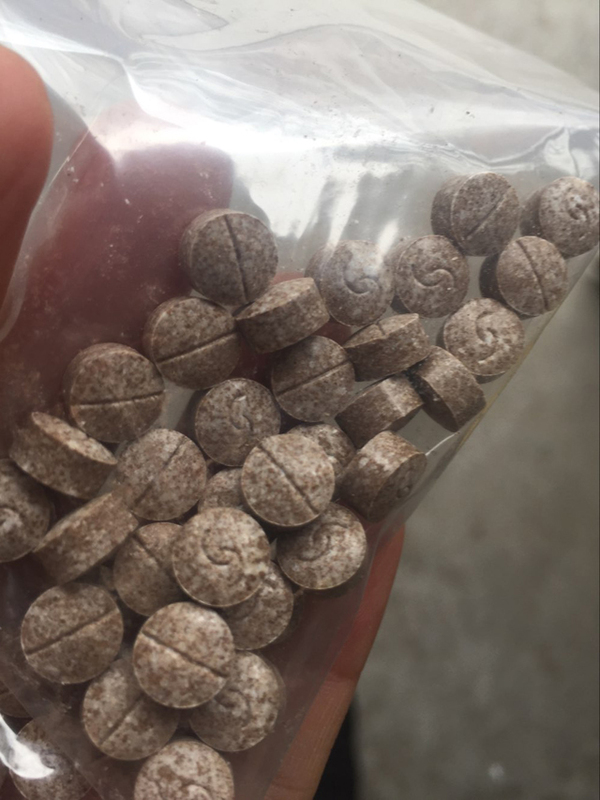 If so this is the right press for you. a.Chemical: disinfection tablets, insect repellent films, camphor ball, detergents, fragrances, catalysts, metallurgy powder,Urotropin (for fast lighter), glass powder, ceramic powder products, charcoal powder,iron powder,art powder, sand round block, magnetic materials. b.Food: candy tablet, seasonings block, Chicken tablets, glucose block,coffee block, chocolate small blocks etc. f.Life products:Soap,dish washing plates.,bathing salt plates,candle,Camphor ball etc. 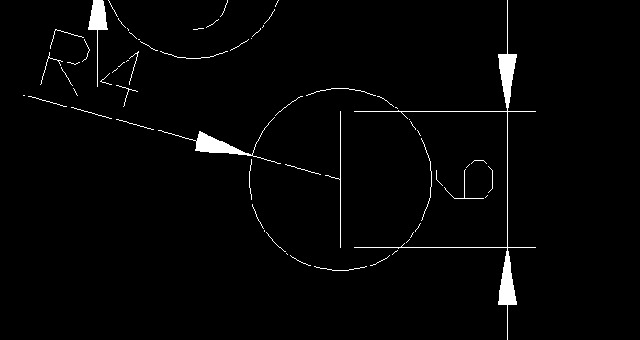 1.Before connected to electrical power,the motor should be connected to ground to ensure safety.First demolition the V-belt,connected to electrical power,starting the motor,observe motor rotation direction whether correct(Motor shaft rotation direction should be with the protective cover or hand-wheel in the opposite direction of the arrow).If the rotation in the wrong direction,another separate cable connection.Then make V-belt installed. 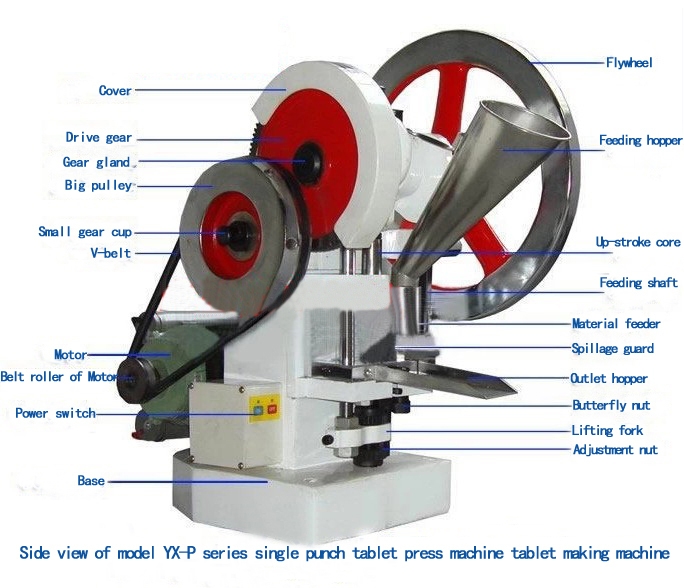 2.Unloading punch dies and adjustment of tablet press. a,Installation punch dies.b,Putting out the adjustment. c,The adjustment of filling the depth(tablet weight adjusted). d,Pressure adjustment. e,die demolition. 1.Tablet machines are best installed either on a solid wooden bench or on concrete, using the bolts provided. The machine sits on feet and the height from the bottom of the machine to the work surface should be 600 mm. In the interests of safety the machine should be properly grounded before being put to use. Remove the rubber belt and connect the power. Observe the machine carefully as it starts up to make sure rotation is in the correct direction – it should follow the same direction as the arrow on the pulley wheel. 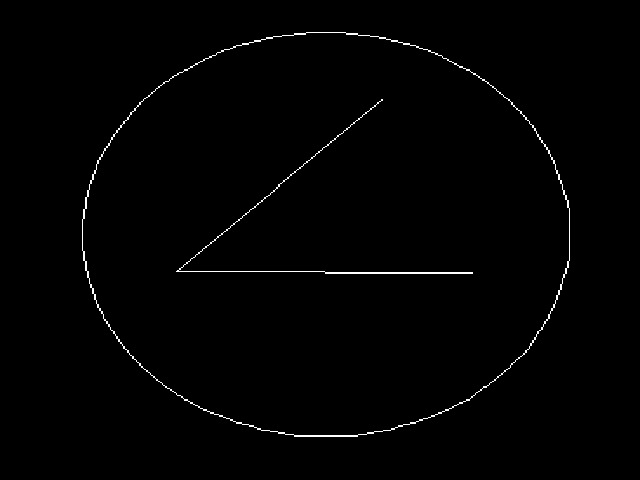 If the direction of rotation is wrong, disconnect the power and reset the triangular belt. Loosen the bolt on the lower punch. Turn the large pulley to raise the core rod to its highest position. screws align properly and can be inserted into the end. Tighten the nut. Loosen the nut on the upper punch. Insert the upper punch into the end of the upper punch rod. Tighten the bolt. Loosen the nut in the mold so that the mold lies flush in its cavity. Insert the lower punch into the cavity in the mold. Tighten the nut on the mold and check the mold is sitting flush. Turn the large pulley by hand to make the upper punch fit carefully into the mold casing. Look out for undesired impact or friction. In the event of either, loosen the screw on the mold platen. Adjust the mold platen so that the screw on the upper punch fits nicely into the die cavity. Tighten the bolt in the die cavity. No friction at this point means installation may proceed. 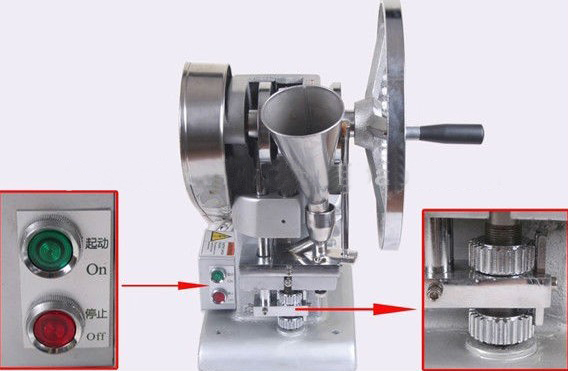 Turn the large pulley to make the lower punch rise to its highest position, and check the lower punch surface is flush – too high or too low will affect the tablets as they exit the machine. If it is not flush, loosen the butterfly screws and loosen the platen rotation gears so that the surfaces slip into alignment. Tighten the butterfly screws. Turn the large pulley by hand and run the machine empty for at least ten minutes. If it runs normally, put in materials and run a pressure test. In this procedure the tablet weight is adjusted. Loosen the butterfly screws and release the platen gear. Adjust the gear by turning it to the left so that the lower punch rises. The depth of the filling and the weight of the tablets will be reduced. After this adjustment tighten the butterfly screws. In this procedure the hardness of the pills is adjusted. Loosen the knurling screw. Make a downward adjustment in the eccentric copper sleeve. The pressure will be increased and the pills will be harder. Reverse the procedure to reduce tablet hardness. After this adjustment tighten the screw and lock the copper sleeve. Thus, adjustment of the dies is complete. Start the motor and run a pressure test on a dozen tablets. 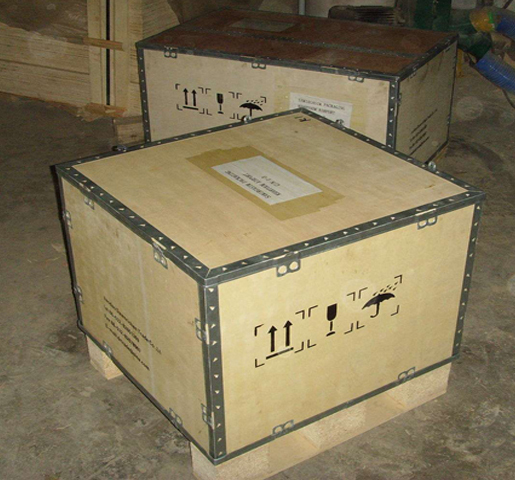 Check for weight, hardness and surface finish. Dismantle the upper punch. Loosen the nut. Remove the punch. If the punch is tight, pull out with your fingers taking care not to damage the edges of the punch shuttle. Loosen the screw in the mold. 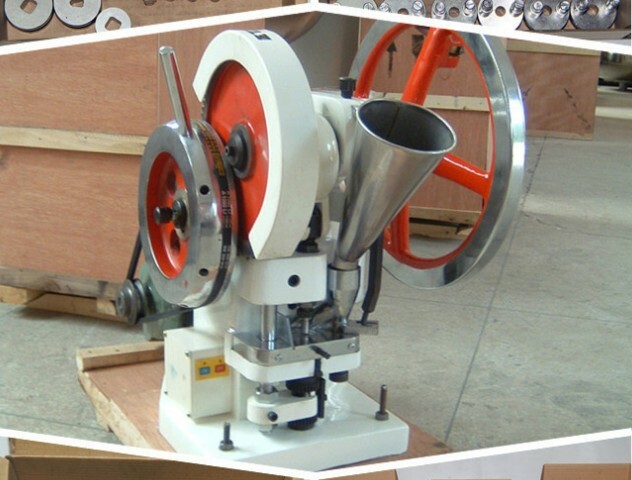 Loosen the screw in the lower punch, loosen the butterfly screws and release the platen gear. Rotate the gear so that the next thrust of the core rod rises by about 10 millimeters. Gently turn the large pulley to bring the next impulse to the top of the mold. If the mold is tight, remove it by hand but take care not to damage parts. Remove the mold platen and then the mold. Rotate the fixed screw on the lower punch by hand to raise the core rod of the lower punch to its highest position. Take out the punch by hand but take care not to damage the edges. After dismantling the die the gears need to be adjusted. Lower the core rod on the lower punch by 10mm. Now you should still be able to rotate the screw of lower punch. 1.Take out the powder board. 3.Rotate the feeder and tighten the screws. 4.Unscrew the feeder and tighten the stub and spring. 6.Unscrew the screw in the mold platen and the spring washers. Loosen the screws on the shaft of the red core rod. Remove spindle (see 5 spindle). When doing the installation load the upper punch first then the spindle. Install the main shaft. Unscrew the screws on the lower punch. 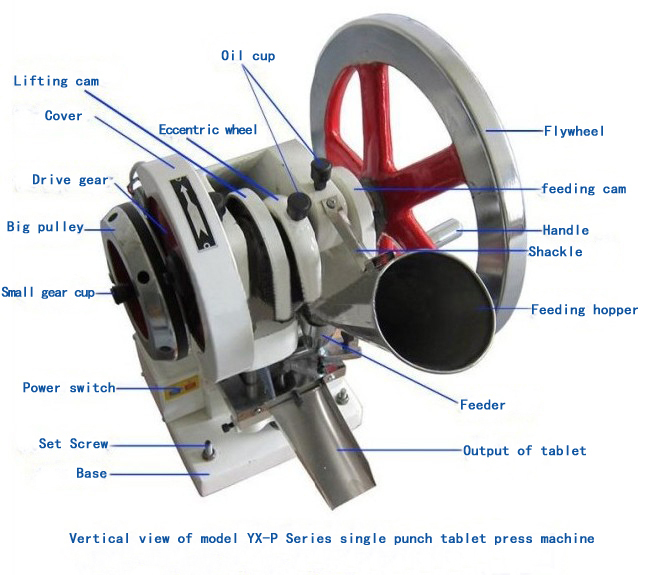 Loosen the butterfly screws and gear platen. Remove from the fuselage under the bottom hole. Take out the lower belt, the screws on the left and right of the bridge shaft and the platen. With a mallet tap the large pulley to remove it from the bridge shaft. Similarly, tap the small gear out with the mallet. Reverse the order of the above procedure. Two pairs of hands are required to dismantle the spindle. First, remove the protective cover. 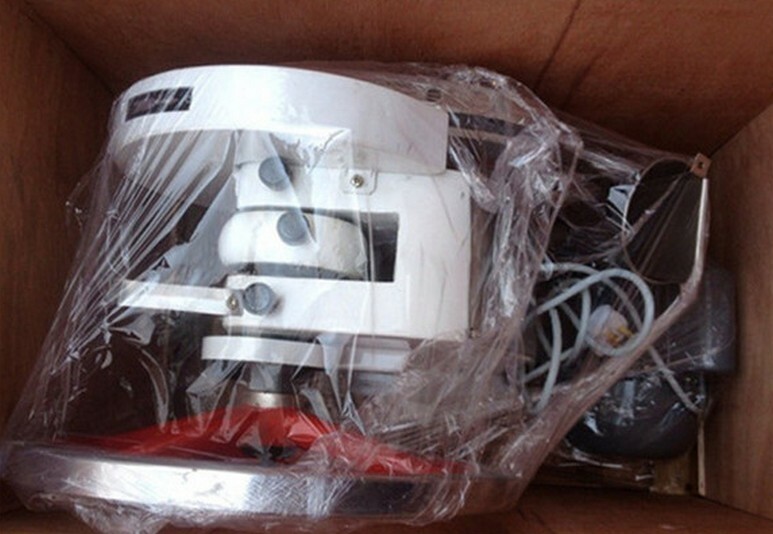 Remove the large gear to release the lifting cam, eccentric wheel and fastening screws. Using the mallet gently knock the end of the shaft to remove it, taking care not to damage the shaft screw and holding the other end of the shaft at the same time. Grip the eccentric shell, lift out the cam and slowly remove the spindle. 17.To install reverse the order of the above procedure. Lubricating moving parts and friction surfaces will ensure normal operation of the machine and prolong the service life of important parts. So lubrication should be added to the oil cups, oil holes and friction surfaces before the tablet machine is used. The machine should have an empty run first. Oil should be added in good time. Do not add too much at one time or cause spillover as there is a risk of contamination. Check every working day. Grease as required. 1.Read the instructions carefully when setting the machine up for the first time, or when using the machine for the first time. 2.This machine must only run in one direction. 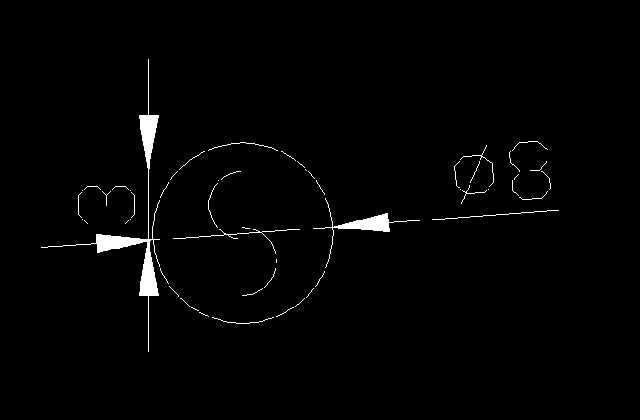 (see the arrow on the hand wheel) Reversing the direction will damage parts. Do not neglect this point particularly when tablets are being adjusted. 3.Adjusting the belt is done through two screws. Following an adjustment, careful fine tuning is necessary. When using with electricity, the upper punch needs to be in its highest position before the machine is turned on. The aim is that the upper punch has maximum inertia or it is very easy for the machine to stick which can lead to breaks. What to do if the machine stops running. 1.Immediately turn off the power to prevent the motor from burning. 2.If the situation is not serious, the machine can be hand cranked if necessary. 3.If the situation is serious, remove the shaft of the upper punch. Lift it out manually to reduce the pressure on it. Take the pills get out by hand gear and re-adjust the hardness of tablets.